Hasselbachers living in New York City in the mid-1800s. It has been my mission to attempt to identify and link together all of the Hasselbachers in the world. I am willing to accept that name belongs to more than a single family, the task a monumental challenge, and that I will fall far short of my goal. Nonetheless, I've done better than I ever dreamed I could do and new challenges keep popping up. As I have tried to trace the larger family lines, I've been aware of unexplained Hasselbachers in unexpected places. Such was the case recently when I found a Wolfgang Hasselbacher and his family in New York City in the mid-1850s. I found him first in New York City Street directories where there are several entries beginning in 1856 through 1892. List of Family Members as of 1870. Wolfgang Hasselbacher of New York City, born in Bavaria about 1816. Barbara Hasselbacher born about 1848 in New York City. Fred (?Friedrich) Hasselbacher, born about 1849 in New York. Elisabeth Hasselbacher, born about 1851 in New York. Jacob Hasselbacher born about 1866 in New York. 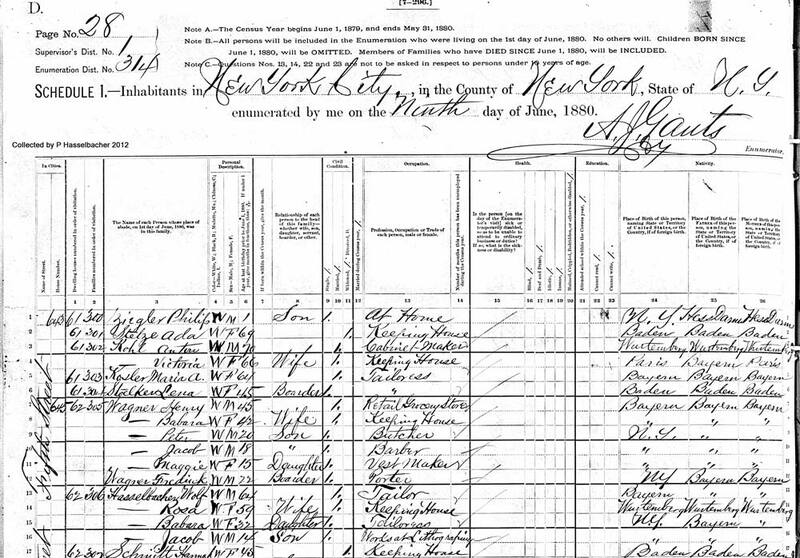 I was not able to find a Hasselbacher in the 1850 or 1860 Census. 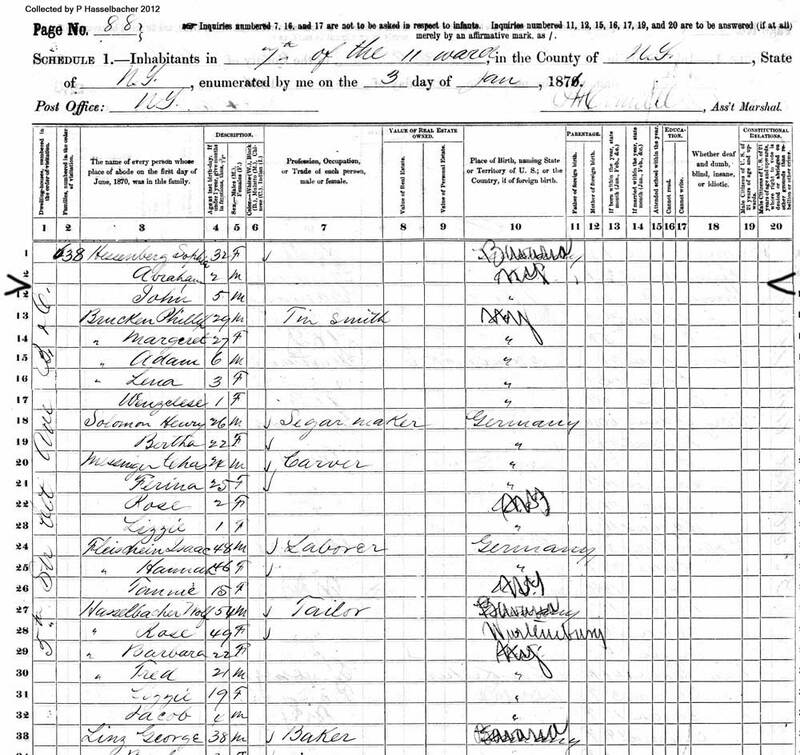 The first census report in which I find him is 1870. He is living on fifth Street, a 54-year-old Taylor from Bavaria. He has a wife Rose 49, and children Barbara 22, Fred, 21, Lizzie 19, and Jacob 4. Rose is said to be from Württemberg and all the children from New York. Württemberg was not part of Bavaria so it is possible the couple met, married, and had their family in America. At 54 years old, Wolfgang would have been born around 1816. We see the family again in the 1880 census still living at 645 5th St. Wolf is now 64 and Rosa 59. Still identified as having come from Bavaria and Wittenberg. Living with the family are Barbara 32 a tailoress, and Jacob who is now 14 and working at lithography. Both children are said again to have been born in New York. Fred and Elisabeth are no longer living with the family. (Elisabeth would have been 29 and of marriageable age.) If we assume that Barbara was born around 1848, then Wolfgang would have come to America before 1848. I also found Wolfgang in the New York City St. directory living at several addresses and always as a tailor. 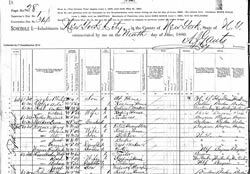 Interestingly, in 1880's name was given as Peter Hasselbacher living at the same address as Wolfgang in the 1880 census. The street directory entries I know about are listed below. 1856	Wolfe Hasselbacher, 212 E. 17th. 1868	Wolf Hasselbacher, 444 Fifth. 1876	Wolf Hasselbacher, 636 Fifth. 1889	Wolfgang Hasselbacher, 645 Fifth. 1891	Wolfgang Hasselbacher, 645 Fifth. Of interest, I find a Frederick Hasselbach in the directory of 1880. He is a "japanner" which is related to painting or lacquering, but also to the application of protective finishes to metal objects. 1880	Frederick Hasselbach, Japanner, 514 E 13th. 1891	Frederick Hasselbach, Japanner, 203 E. 102d. 1892	Frederick Hasselbach, Grocer 103 E. 102d. Of additional interest, there were a few handfulls of Hasselbach and in 1868 a John Haselbacher with one 's' who was a shoemaker and Regina who was a candy maker living at the same 1272 3rd Ave address. I found no other Hasselbachers in the directory over this interval. I have not been able to find a ship's passenger list. Who knows anything about these families? If one of you finds this page, please contact me!